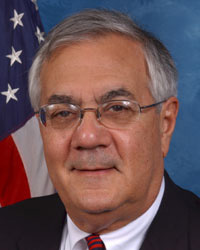 Barney Frank (D-MASS 4th District) has been a member of Congress since 1981. Barney is a senior Democrat on the Financial Services Committee. Previously, he was the Massachusetts State Representative and an Assistant to the Mayor of Boston. He has also taught at several Boston area universities. While in the Massachusetts Legislature, he completed his J.D. at Harvard Law School. Barney has been one of the strongest Congressional voices for senior housing. He was one of the primary sponsors of legislation authorizing the prepayment and financing of Section 202-8 properties, and he maintains a watchful eye on its implementation. Barney also intercedes when necessary on behalf of sponsors working on refinancing. He was instrumental in shepherding Peter Sanborn Place, one of the first refinanced 202’s in the nation. Congressman Frank also helped to get changes in the underwriting guidelines for refinancing with FHA insurance. He is the author of Mixed Finance Statutory Language, which permits the combination of Section 202 capital advances with low-income housing tax credits. Barney is a strong advocate for increased funding for all affordable housing programs, including the Section 202 program for the elderly and the Section 811 programs for persons with disabilities. He is a strong supporter and chief advocate of the affordable housing fund without restrictions on non-profits in the GSE regulatory reform legislation. Congressman Frank was one of the primary sponsors of legislation to preserve affordable housing for seniors and families, and he was one of the primary sponsors of exception Section 8 rents under the mark to market program for seniors and other vulnerable populations. He introduced legislation to address the preservation of affordable housing when mortgages mature, and he sponsored multi-family property disposition legislation with a right of first refusal for nonprofits to acquire and rehabilitate affordable housing in foreclosure. Just this month he has spoken out strongly against a net reduction in funding for HUD’s affordable housing program of $1.15 billion, which included a $190 million cut for Section 202 elderly housing (26 percent), which would reduce the annual number of elderly housing units built nationally to 2700. Congressman Frank’s voice is needed in Congress now more than ever at a time when the number of persons needing affordable housing is increasing, the number of new units constructed is decreasing, and a large number of existing units are being converted to market rents. For what Congressman Frank has done and what he continues to do, Retirement Housing Foundation is pleased to present him with our 2006 Friend of the Elderly Award.